Sugar Bytes’ simple but effective production tool helps you turn your ideas into music — fast! 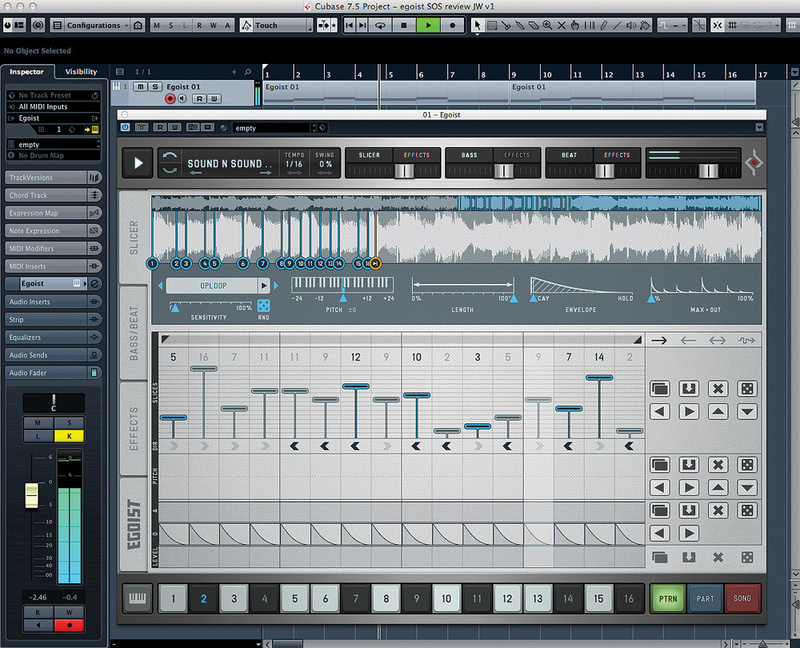 There are all sorts of brilliant software options for electronic dance music production. Sugar Bytes have built quite a fan base in this broad area with software such as the step–based multi–effects sequencer Effectrix (reviewed in SOS March 2009: www.soundonsound.com/sos/mar09/articles/sugarbytes.htm), Turnado real–time multi–effects and Thesys, a very powerful step–sequencer plug–in. Each of these tools offers very accessible, and sometimes very leftfield, creative options for electronic musicians, and it comes as no surprise that the latest addition to the Sugar Bytes product line is aimed at the same audience. There are three basic elements to Egoist. First you get a loop slicer where you can, ReCycle–style, slice a loop (automatically or manually) and map those slices to MIDI notes. Second, you get a simple bass synth. This is not going to win prizes for its complexity, but it is easy to use and can give you a solid foundation. Third, you get an equally straightforward drum machine — just kick, snare and hi–hats — with multiple kits to choose from and a diverse set of electronic drum sounds to explore. All three of these sound sources have access to a pattern–based step sequencer. A project can contain 16 patterns, and each pattern can contain its own audio loop within the slicer, plus a set of bass and drum sounds. Patterns can be sequenced into Parts and Parts into a Song. While you can do pattern sequencing within your DAW/sequencer when using Egoist as a plug–in, as it also runs as a stand–alone application, you could also create complete song structures just using Egoist. Audio effects are also included. In fact, the effects section is almost Effectrix in miniature, with seven different effects — filter, delay, reverb, bit–crusher, chorus, tape stop and looper — that can be step–sequenced as part of every pattern. You can toggle whether each of the three sound sources pass through this effects chain. Once purchased, installation presents a 700MB download (thanks to the associated library of loops and present patterns) and requires a serial number for activation. This proved utterly painless and, once the download was complete, I was up and running with both the stand–alone and plug–in versions within a couple of minutes. The plug–in version ran very smoothly in an instrument track within Cubase (there are instructions for use with a number of the major sequencers within the PDF manual) and the main settings page allows you to easily configure sync with the host program. As with most Sugar Bytes software, there is quite a lot packed into a fairly compact interface. A top strip of controls provides access to the transport controls, undo/redo, presets, step length (in terms of bar divisions), swing setting and then a series of volume faders for each of the three sound sources, plus a master output level. Buttons above the faders toggle each instrument on and off, and set whether it is routed to the effects. 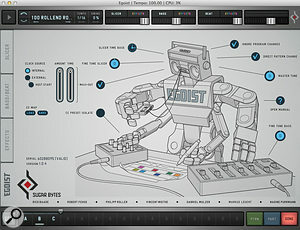 Down the left edge are four tabs labelled Slicer, Bass/Beat, Effects and Egoist, which present the four main control screens. At the base of the screen, the display changes depending upon whether you are working in Pattern, Part or Song mode. In addition, there is also a keyboard icon that enables the rather nice Slice Keys mode where you can play the 16 available slices from a MIDI keyboard. The Egoist page contains a number of global settings. The Egoist tab is devoted to global settings, many of which are of the ‘set and forget’ nature; the more important ones include the host sync mode, the time base for the Slicer (changing how the slicing is done) and the Max–Out maximiser control (for extra pumping). Flip to the Slicer screen (see the main screenshot accompanying this review) and things get a little busier. A waveform display and slicing tools dominate the top area, where you can load a factory loop or one of your own, change its pitch over ±2 octaves and set the slicing sensitivity. Slices can also be manually adjusted. Here and elsewhere in the instrument you’ll see a dice icon: if you just want a bit of random inspiration, click this until something you like emerges! The Length control is the equivalent of the ‘gate’ setting you find in some other step sequencers, while the Envelope allows you to apply a global sustain/decay for all slices. Beneath the waveform section are a series of lanes for creating your slice–based step pattern. If you toggle pattern mode on, you can then select one of the 16 patterns for editing in the sequencer. There are all sorts of options here. You can select which slice plays at each step with the vertical faders, change the step length of the pattern (patterns in a project can have different lengths), mute a step, reverse it, and choose to play the whole pattern forwards, backwards, or in a random order. Other lanes allow you to apply step–based pitch changes (so you can easily create melodies), set the level and apply step–based attack/decay. The tools to the right allow you to copy and paste settings in various ways and, again, roll the dice to embrace pot luck. At the bottom of this section are copy/paste/delete/dice tools that work on a whole pattern level; once you have created one pattern you like, therefore, it is easy to duplicate it and then tweak to create variations. Overall, the Slicer has plenty of creative options and perhaps the only extra ‘lane’ I’d have liked would be for panning. One for a future update maybe? 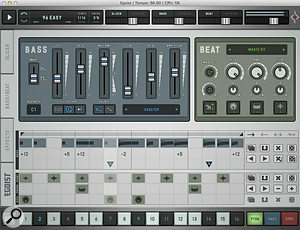 The Bass/Beat page provides similar, if slightly more streamlined, sound editing and step sequencing for the bass and drum instruments. The Bass synth is a very simple single–oscillator affair with square or saw waveforms, a filter, a rather nice overdrive, and basic modulation options. In the drum unit you can pick between multiple kits covering different styles and, within each kit, you get a choice of over 30 kick, snare and hi–hat sounds with pitch and level adjustment. Again, there is enough variety to keep you interested without things getting overloaded. 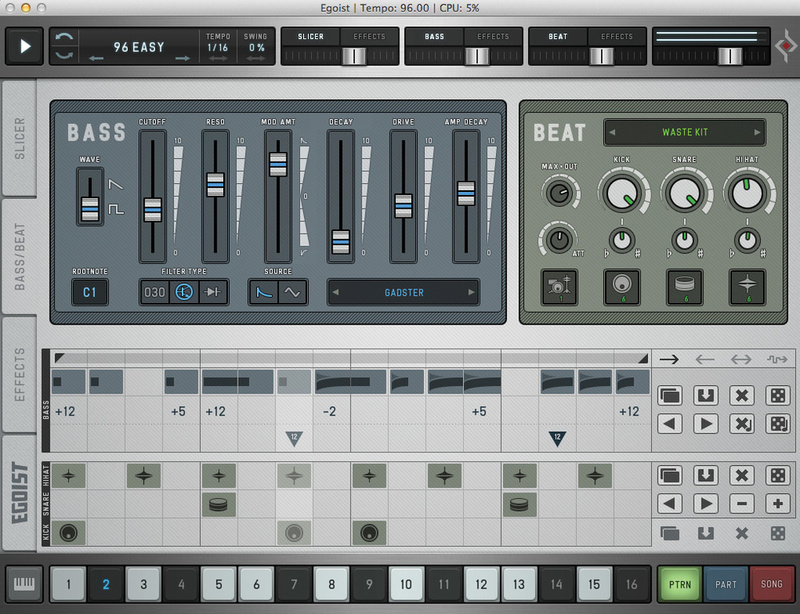 This page allows you to tweak bass and drum sounds and their step–sequencer patterns. In the step–sequencer section, the three lanes for the bass allow you to define note length/type, pitch and then coarse pitch (±1 octave). Note length can be set and ties can also be specified. You can also use glide notes to add some nice additional pitch variation. Drums, meanwhile, get a simple one–lane–per–sound arrangement. 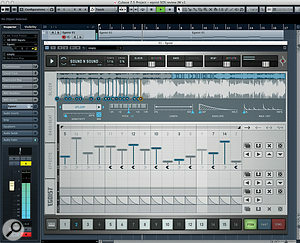 As with most drum-grid displays, tapping on a step creates a ‘hit’. If you tap a second time you get a second velocity level (or an open hi–hat alternative sound) and a third tap clears the step. As with the Slicer page, the right–hand side of both sets of lanes provides various copy/paste/randomise options. However, rather nicely, the drum controls include increment and decrement buttons which give you access to a small collection of basic drum beat presets — great if you just want to get a groove going quickly. In use, Egoist is a lot of fun. All three sound elements are ‘minimalist’ in their own way, but this is most definitely a case of the sum being greater than the parts. Sugar Bytes include a huge selection of presets, which provide a very clear demonstration of the potential. It is actually possible to coax a decent range of sounds from the bass and drum units and, because you can add in sounds via your own audio loops (and each pattern in a project can use a different audio loop if required), there is plenty of sonic potential. 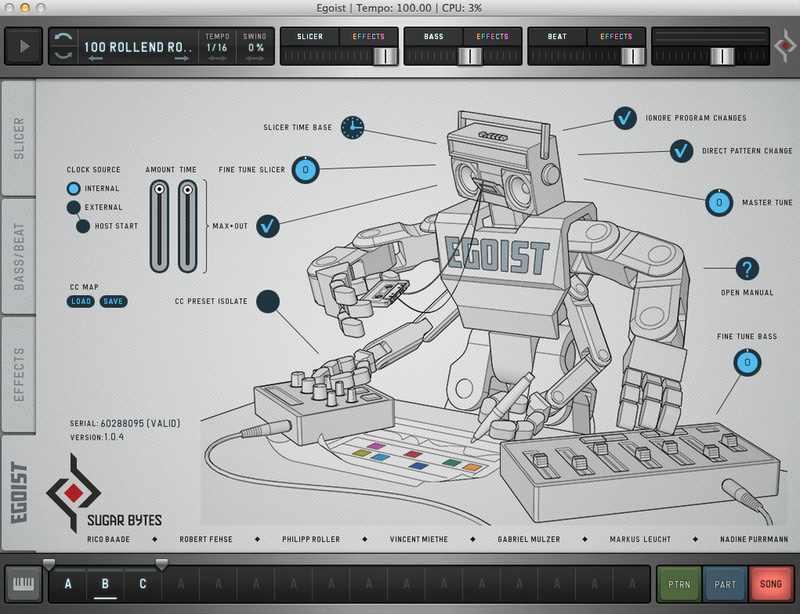 Add in those effects and, for creating glitchy, quirky, electronic grooves and beds, Egoist is a great little tool. Sugar Bytes are presenting Egoist as a ‘get it done quick’ musical idea generator, and I think they have pretty much pulled it off. Having created a set of patterns, the additional ability to then chain those into up to six Parts and then sequence Parts into a Song means that you can very quickly move from a basic idea to a complete song structure even if using Egoist outside a DAW host. It would, therefore, make a great option as an electronic idea sketchpad on even a modestly specified laptop for working on the move. If I was to identify one omission from the current Egoist specification, it would be a lack of MIDI output. You can trigger playback of patterns from a MIDI keyboard, and the Slice Keys mode is brilliant fun too; there is also a MIDI Learn option that you can access by simply right–clicking on any of the controls. However, as far as I can see, you can’t use your Egoist MIDI patterns to drive more fully featured virtual instruments. This would, however, be great to see. I’m happy to admit to being a bit of a fan of what Sugar Bytes do. 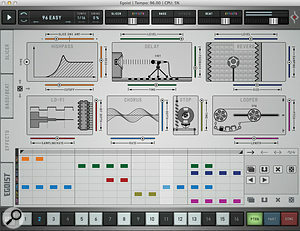 Their software always seems to bring a unique take on what might be familiar concepts, and with Egoist, they have taken the loop/groove box idea and presented it in a format that is efficient, but also great fun. The streamlined feature set is actually one of Egoist’s main attractions, so it would be a shame if Sugar Bytes strayed too far from the current design. However, I think the interface could bear a couple of additions — such as MIDI out and slice pan — without losing the essence of what makes it so good. Even as it stands, though, Egoist is a joy to use and, as a means of quickly generating electronic music ideas, is a very cool little tool at a very competitive price. It’s perhaps not quite such a wild ride as something like iZotope’s BreakTweaker, but it is still far enough left of centre to create some brilliant results. If you like building your electronic music from loops and grooves, and you like to be able to work quickly, Egoist is most certainly going to appeal. While there are lots of loop/groove tools out there, if you have an experimental streak — and you probably need one to compete in today’s crowded EDM production scene — some interesting alternatives to Egoist would include iZotope’s brilliant BreakTweaker or Heavyocity’s DM307 (for Kontakt). Both can produce great results, but perhaps trade a little more depth for a slightly steeper learning curve when compared to Egoist. 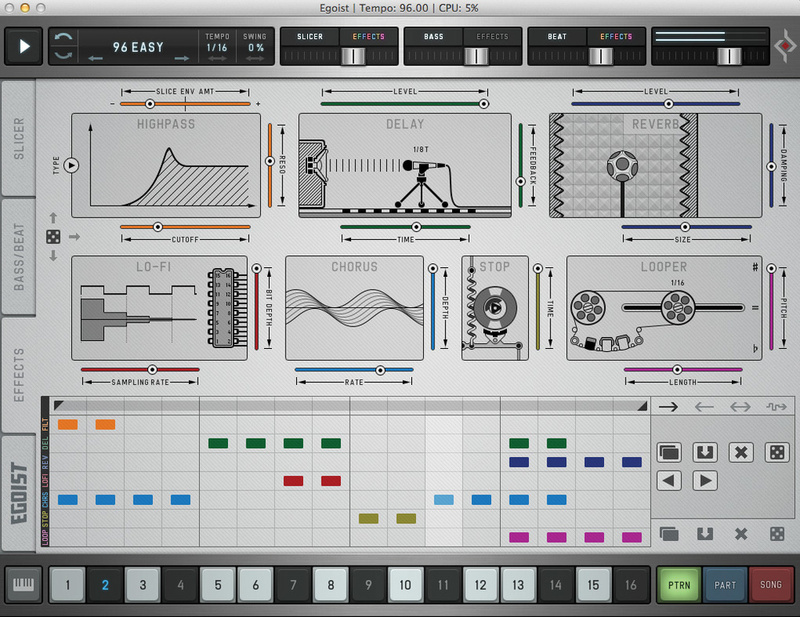 If you have used Sugar Bytes’ Effectrix, the ‘Effectrix mini’ format of Egoist’s Effects page will feel very familiar. Here, you can sequence the application of the seven available effects via the step–sequencer lanes at the base of the page. In the upper half of the display you can configure the effects settings themselves. There are some rather cute–looking, but very functional, graphics going on here, The Effects page offers a ‘mini–Effectrix’, with seven effects that can be step–sequenced within the pattern.particularly in the delay and reverb effects. Being able to reverse and randomise the effects sequence can also throw up all sorts of extra possibilities for pattern variation. Indeed, applying the random option essentially means your pattern sounds slightly different every time it triggers, which is very cool indeed. Efficient workflow but with plenty of creative options. No MIDI output options at present. A pan lane in the Slicer would be good. If you are looking for a compact, yet very creative, loop/groove idea toolbox, Egoist is a great choice, and it’s definitely a product that experimental electronic music makers should explore. Apple iMac with 3.4GHz quad–core i7 CPU and 16GB RAM, running OS 10.9.5. Tested with Focusrite Scarlett 8i6, Steinberg Cubase 7.5.